Home ~ Presentation Psychology ~ No Presentations! Is the pen mightier than the slide? I had an idea to do something different during a guest lecture at a conference. Instead of my usual Killer Presentations Seminar – essentially a PowerPoint presentation about how to use PowerPoint effectively – I would ditch the slides for a whiteboard and pen. 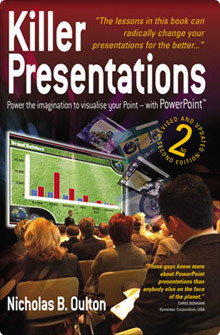 I want to demonstrate how a presentation can be engaging and memorable without using modern technology. Lets step back 20 years to the good old days of handwritten visual aids and see what we can learn from the experience. Now clearly I’m not suggesting we all stop using PowerPoint, but if I can make it more engaging and more memorable than the other 26 slide-driven presentations at the conference then maybe, just maybe we can make people rethink what they do with PowerPoint. Slides give us a crutch and a barrier to hide behind. If they’re cool, you don’t need to be. 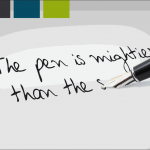 Without them I feel undressed – no graphics, no design, no frills – just me, them and a pen. For two weeks, I have been planning my presentation and the adrenaline is pumping. It’s actually a positive force for me. I think I may be a bit of an adrenaline junky. The thought that this might not go as well as planned is really motivating me to plan it well. At least I don’t need to worry about the power going out. I’ll let you know how it goes.